This week on the Bridalista spotlight, we are covering the recent trend of having your favorite food truck vendors cater on the big day! Many brides are opting for this option for several reasons including price, selection, and an added element of fun and surprise! Here are some things to consider if you’re thinking about joining the food truck frenzy! When thinking about whether or not a food truck wedding is the right choice for you, one big factor to consider is the time of year you’re getting married! Your guests will most likely be standing in line outside, so making sure they are relaxed and comfortable is a priority. Ice cream or slushies in the summer and a hot chocolate bar in the winter would be ideal! You also have the choice of picking food that is seasonally appropriate and matches your wedding theme! Who doesn’t love making a custom food menu?! One great thing about food trucks is that they are made to feed a lot of people quickly, but it does still take time for guests to make their way through the food line! 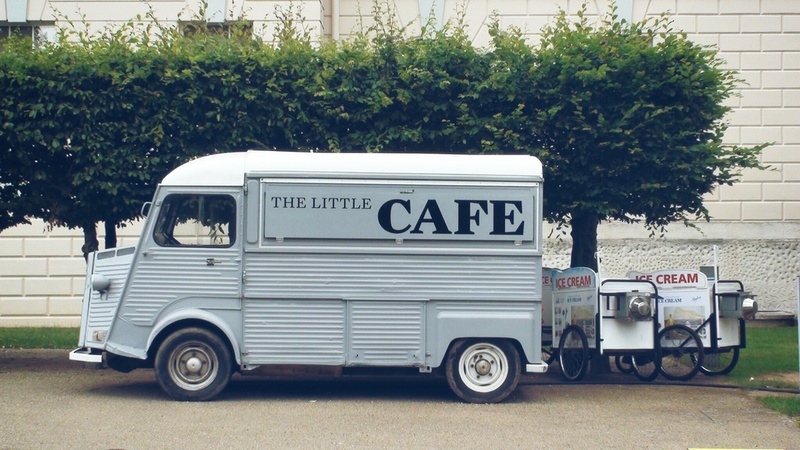 The best way to avoid any unnecessary backup is to plan for at least one food truck for every 65-75 guests. This will keep things flowing and also give your guests a wide range of different options! After hours of drinking, dancing, eating, and celebrating the best way to reward your guests is by satisfying their late night snack craving! Funnel cakes, corn dogs, popcorn, and pretzels are just some of the food options that will have your guests lining up. This is also a great option for indoor weddings, as many snack food trucks also come in mini carts that can be wheeled into any venue! ©2017 Blue Bridal Boutique. All rights reserved.